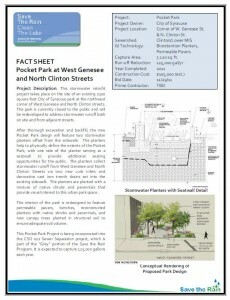 This stormwater retrofit project takes place at Robert R. Haggart Park, which was dedicated in the memory of the late Post Standard columnist. 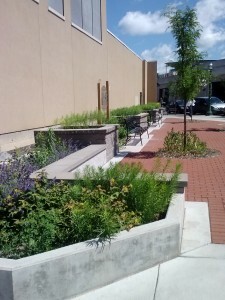 The 2500 square foot City of Syracuse “pocket park” is located at the northwest corner of West Genesee and North Clinton streets. The park is nearly complete and has been redeveloped to address stormwater runoff both on site and from adjacent streets. 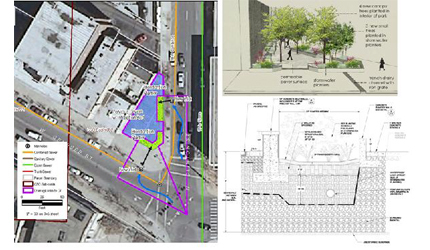 After thorough excavation and backfill, the new pocket park design included two stormwater planters offset from the sidewalk. The planters help to physically define the extents of the pocket park, with one side of the planter serving as a seatwall to provide additional seating opportunities for the public. The planters collect stormwater runoff from West Genesee and North Clinton Streets via two new curb inlets and decorative cast iron trench drains set into the existing sidewalk. The planters are vegetated with a mixture of native shrubs and perennials that provide visual interest in this urban park space. The interior of the park is redesigned to feature permeable pavers, benches, reconstructed planters with native shrubs and perennials, and new canopy trees planted in structural soil to ensure adequate soil volume. This project is a “Greening the Gray” project, associated with the CSO 022 Sewer Separation project. It is expected to capture 125,000 gallons of stormwater runoff each year. 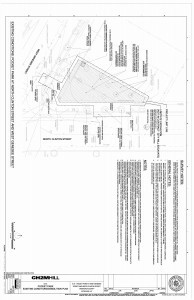 Next Project: Vacant Lot: 701 Oswego St.